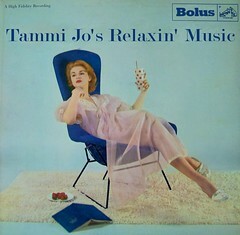 Tammi Jo's Relaxin' Music: Hi-Ho, Steve-o! Hey relaxers! 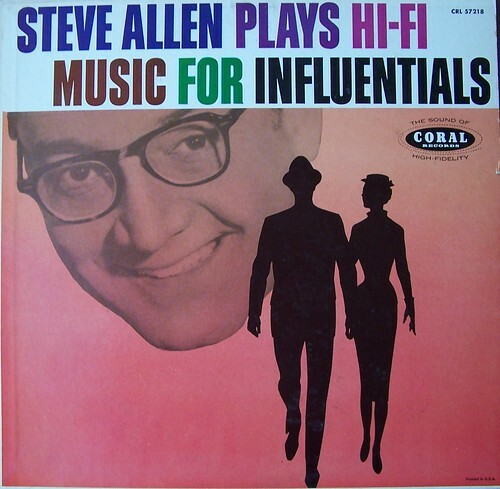 Pour a highball and cozy up in the coconut chair for a listen to today's selection, Steve Allen's "Hi-Fi Music For Influentials" (Coral 57218). It seems to be a high-concept thingy prompted by a Saturday Evening Post ad campaign that touted its readers as "Influentials," which are described as a breed of 1958 proto-urban hipsters; "They are gregarious, active and admired. Their 'cha-cha-ing' at the school dance or community social has the whole crowd taking lessons at Madame LaZonga's... these men and women are younger, fun-loving, well-informed and articulate people who lead the way to new things new experiences!" Blah blah blah, then some stuff about how they all read Saturday Evening Post. The tunes on the LP are mostly reprises of old standards like "When You're Smiling," "Blue Moon," etc., padded with a few thematic Steverino originals like "You're So Influential," all annotated with Steve's explanation of how it relates to Influentialnessity. E.g. for his original song "I'll Tell the World," Steve sez: "Sparked by the constant desire to share the richness they find in living, their enthusiasm, their ideas are simultaneously contagious and welcomed." I'd like to take just a few minutes to tell you about this new album. It's called Music for Influentials and this is how I came to record it and what it's all about. Last Spring, one of the biggest teaser promotional campaigns of recent years, had everybody wondering "Who Is the INFLUENTIAL?" In our neighborhood guesses ranged from John Foster Dulles to Gordon Hathaway. As a matter of fact, as I recall, we did actually have Gordon claim to be "The INFLUENTIAL" in one of our man on the street interviews. But, despite Gordon's claims to the contrary, we found out the "INFLUENTIAL" was not any one person, but rather a type of person. Influentials are all kinds of people -- millions of people. And according to the Saturday Evening Post -- on the basis of extensive research-- "INFLUENTIALS" all have certain specific qualities in common. They are interesting people. They are people who count, because they make it their business to keep up with the best the world offers. "INFLUENTIALS" are younger, enthusiastic people-- people you like to talk with at parties, bars, on trains. They're all kinds of people--guys and gals who are listened to and respected by their friends. As you can gather by now, this whole idea is of great interest to me... for a couple of good reasons. First of all "INFLUENTIALS" are important people--they're important to their friends, they're important to business-- they are important to me... And of course if you sell an "INFLUENTIAL" on an idea, or a product, you can bet he'll be telling and selling his friends. For a album targeted to the vanguard of 1958 America consumerist lemming society, surprisingly refreshing! Play it at your next cocktail party, while you entertain rapt non-INFLUENTIAL friends with your product recommendations.